Join the Wapping Wharf Christmas festivities on December 2nd! On Saturday, December 2nd, the independent businesses at Wapping Wharf will be coming together to celebrate Christmas from 12pm to 6pm. On the day, there’ll be a whole host of offers and discounts at Wapping Wharf, as well as special Christmas food and drink and more. Expect everything from a satsuma peeling competition to Madeira tasting, Greek seasonal specials to mulled wine and cider, a hog roast to Christmas mandarin Margaritas…there’ll be something for everyone, and some surprise entertainment too! The event is free to attend, and timed to coincide with Small Business Saturday, echoing Wapping Wharf’s ethos of supporting independent local businesses. Woky Ko will be serving a limited-edition Christmas Bao. Corks of Cargo will be offering free tasters of two different Madeiras plus traditional molasses cake. There will also be mulled wine to buy with Christmas case offers kicking off too. Warm up on BOX-E’s terrace with a hot gin toddy; pre-order cured salmon for Christmas; and beat your friends, family or the clock in a satsuma peeling contest. At Bertha’s Pizza, kids can eat free between 12 and 6pm when an accompanying adult purchases a pizza. While they wait they can also watch their pizza being made and cooked up close. Gopal’s Curry Shack will be offering a 10% discount on all purchases on the day. Be the first to get your hands on their sought-after range of Christmas chutneys and pickles. The Athenian will be selling seasonal specials such as Greek Melomakarona (Greek honey-based bite-sized desserts) and Kourabiedes (shortbread covered in icing sugar). Brothers We Stand will be offering a 10% discount on all clothing throughout the day. The Mighty Quinns Flower Emporium will be launching the sale of gorgeous Somerset-grown Christmas trees. #grownnotflown. The Bristol Cheesemonger will be offering a discounted cheese selection to take away as well as some complimentary festive nibbles. Bristol Cider Shop will be offering a free festive mulled cider with every purchase over £20. Root will offer a free glass of mulled wine with Stilton and Eccles Cake taster bites. Mabboo will be offering 10% off all products all day. First 50 customers will also receive a free mince pie! There will be a hog roast out the front of Pigsty with hog roast baps for sale. This will mark the launch of Pigsty’s Christmas menu and you can take advantage of 10% off their new Ho Ho Hog Christmas burger from 12pm – close. Loop Massage will be offering 10% off products only and will be serving mince pies. Salt and Malt will be offering free hot cider to all customers and extending its kids-eat-free offering to all day. Portside Gallery will be offering 10% discount on all Jane Reeves fused glass throughout the day. Oliver’s Ice Cream will be launching its exclusive range of Christmas chocolates (both their own and amazing handpicked varieties from abroad and home) and offering free tasting of our Christmas Ice Cream. Come and celebrate Wintertime at Wild Beer. Bring the family as children will eat free when accompanied by an eating adult from 12 – 6pm and sample some of their exciting and delicious beer. Spuntino Cargo will be offering a set lunch menu for the day, including a special Christmas drink, a burger and a side. Try The Pickled Brisket’s winter menu including the NEW Pastrami & Turkey Reuben and their Cargo Grilled Cheese. Plus they’ll have a full range of Gingerbeard’s preserves to fill those stockings. 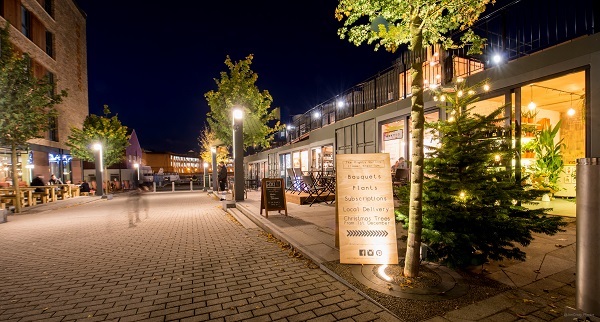 This Christmas is the first time the public will be able to celebrate the festive season with the full line-up of Wapping Wharf phase one businesses, as all the retailers along Gaol Ferry Steps, within CARGO 1 and CARGO 2 will be open.